125 years ago: Benjamin Cluff Jr. initiates a math club in 1885 to boost student interest in the subject. Club members would practice principles of accounting, engineering, and surveying. 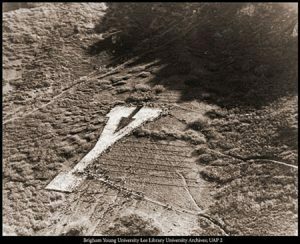 100 years ago: Workers begin adding serifs to the Y on the mountain above campus, creating the familiar block-Y shape. 75 years ago: In an effort to improve school spirit, the student body government prints and distributes 1,000 copies of the College Song, the Pep Song, and several school yells. 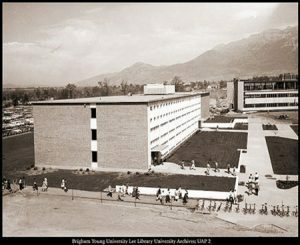 5 0 years ago: Named for a famed BYU benefactor, the Jesse Knight Building is completed and dedicated in 1960. The 78,687-square-foot structure would house the College of Commerce and provide office space for faculty. 25 years ago: BYU student Sharlene Wells (BA ’88) serves as Miss America 1985 after winning the title in September 1984. During her year as Miss America, she traveled nearly a quarter-million miles. 10 years ago: BYUTV is launched on Dish Network, bringing devotionals, general conference, BYU athletics, and various family programs to 3.4 million viewers across the United States. 5 years ago: Renowned BYU professor emeritus of ancient scripture Hugh W. Nibley passes away of natural causes at age 94.